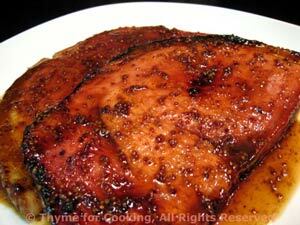 Grilled Ham with Red-eye Glaze, Thyme for Cooking gourmet recipes. When I lived in the U.S. I loved smoked pork chops - so substitute those if you like. With it, a simple pasta dish, with some beans and whatever herbs are in the garden or fridge. 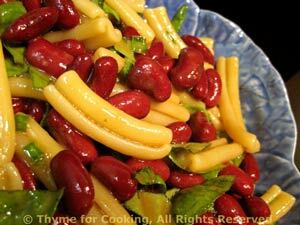 Pasta, with red beans and fresh herbs, lightly dressed with a simple vinaigrette makes a perfect accompaniment to grilled meats. Mix soy sauce and vinegar in a small bowl. Put beans, herbs and vinaigrette into a large bowl. When pasta is done, drain and add.